Best aesthetics: Child of Light, which is utterly beautiful in motion — screenshots don’t do it justice. Honourable mentions include The Banner Saga (artwork and music), Endless Legend (artwork and the best music in a 4X game this side of Dominions), and Valiant Hearts (artwork). Favourite game mechanic: Tribes, a recent addition to Crusader Kings 2 — they came out in the patch that accompanied 2014’s Charlemagne expansion. Tribes are poor and prone to political fragmentation, yet in the hands of a prestigious leader, they can punch well above their weight — a brilliant abstraction of the historical threat that tribal peoples could pose to their more developed neighbours. Favourite moments: Perhaps my single favourite gaming experience all year was riding out of the steppes at the head of a short-lived tribal empire in Crusader Kings 2: Charlemagne. At the same time, I was reading Francis Fukuyama’s superb The Origins of Political Order, a book about the evolution of modern government. As I went from nobody to conqueror and finally to ruler, it felt as though history had come to life on my screen. There was no shortage of other great moments. My first amphibious assault in Wargame: Red Dragon. Battling an enormous hydra in Child of Light, while a choir roared in the background. Every summoner duel in Final Fantasy X HD. A brief conversation in FFX, in which a strong, silent lunk revealed himself as a loving guardian, and another one, in which a once-arrogant man showed what his son meant to him. Pounding the pavement in Sherlock Holmes: Crimes and Punishment, assessing the reliability of witnesses, and forming my own theory of the case. Finally beating the Western powers, and uniting China, in two different games of Europa Universalis IV. Gradually pushing soldiers forward in Valkyria Chronicles, trying to clear a safe path for my tank. One particular punchline in Tales from the Borderlands (”He must really have to go!”). I also have to give props to some pre-2014 games. Parking my ace sniper on top of a train in XCOM: Enemy Within is one of my vivid gaming memories of the year. Alien on the left? BLAM! Alien on the right? BLAM! 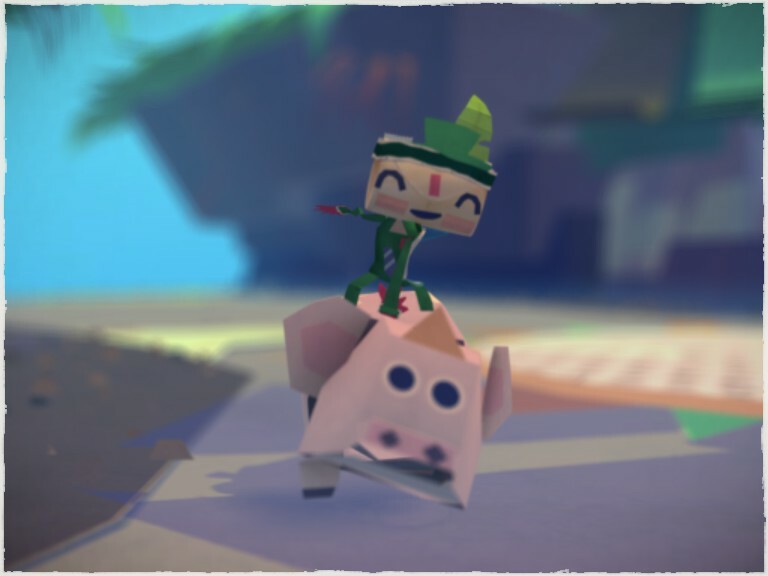 And check out this selfie I took while riding a pig in Tearaway. Favourite setting: Endless Legend and, if ports count, Final Fantasy X HD. Endless Legend feels like a “throw everything in the pot” mishmash, where disembodied, vampiric suits of armour compete with the descendants of stranded space marines. FFX’s world is a more coherent mix of “cultures, rituals, and creatures”, bound together by the recurring quest upon which the protagonists embark. Both benefit from being long on imagination, short on cliche. Missed potential: The bland, disappointing Civilization: Beyond Earth takes the prize — Civilization V was a better Civ game and Alpha Centauri was a better science fiction game. The runner-up is Child of Light, whose generic villain and generic collect-the-widgets fantasy plot could have been so much better if the writers had linked them to the genuinely interesting backstory. Most improved sequel: Endless Legend. From the brief time I spent with Endless Legend’s predecessor, Endless Space, I got the impression of a game that tried too hard to clone Master of Orion 2. Nobody could say the same about Endless Legend, which puts its own spin on everything from city placement to unit design. Most underrated: This is a toss-up between Sherlock Holmes: Crimes and Punishments and Warlock 2: The Exiled. Both games drew mildly positive Metacritic scores (mid- to high-70s) and remarkably little player buzz. That’s a shame — both games are unique, enjoyable twists on their respective genres, well worth a look. Noteworthy games I didn’t get around to: I’ve only scratched the surface of Dark Souls 2, the well-regarded Ultimate General: Gettysburg, and Lara Croft and the Temple of Osiris. I still haven’t touched the (also well-regarded) Shadowrun: Dragonfall. And I’m waiting for a better price on Company of Heroes 2: Ardennes Assault. Noteworthy trend 1: Beautiful 2D artwork. Out of my four ‘best aesthetics’ games (Child of Light, The Banner Saga, Endless Legend, and Valiant Hearts), every one except Endless Legend is in 2D. Noteworthy trend 2: Age of Wonders III and Endless Legend were marred by the old curse of the strategy genre, the weak late game. (Notably, this comes three years after Total War: Shogun 2 blasted endgame problems out of the water.) I understand that AOW3‘s expansion improved the late game — perhaps we might see the same for Endless Legend. Noteworthy trend 3: If Sherlock Holmes: Crimes and Punishments and Tales from the Borderlands are any indication, adventure games seem to be eschewing “use item A with item B” puzzles in favour of interactive storytelling. Crimes and Punishments has lots of minigames, and a fair amount of pixel-hunting to gather clues, after which the real puzzle occurs in the player’s mind: whodunnit? And Tales is about choosing the way one responds to conversations (and crises). Personally, I think this is long overdue — adventure games have often suffered from a mismatch between theme and puzzly mechanics. Game of the year: Picking out a single GOTY has been difficult for me. During the year, we saw a lot of contenders for “most interesting concept”: each does something novel, and does it well enough to be worth a glance. On the other hand, each of them is also held back by a flaw or flaws. Instead, my favourite games were originally released years ago. One had been substantially expanded since I last played, back at launch; 2014 marked the year I fell in love. Another was a game that I played for the first time after it was ported to modern consoles in 2014. And one was an expansion pack that I’d abandoned in frustration last year, before embracing in 2014. The first game is Crusader Kings II. Mechanically, it has its flaws — whack-a-mole rebels can be exasperating, and reportedly, a bug in the latest patch can even prevent AI players declaring war. As a collection of experiences, and as a journey into history, CK2 has been extraordinary. Rising and falling as a tribal chief on the Silk Road. Trying to reconquer Persia as a Zoroastrian warlord. Terrorising Europe as Ragnar Lodbrok. Rebuilding the Byzantine Empire, and sneaking in a trading expedition along the way, as Emperor Alexios Komnenos. Before 2014’s additions, some of these stories would have played out differently; others would not have been possible at all. And so, Crusader Kings II, with expansions, is my Game of the Year. The second game is Final Fantasy X HD. Had you asked me soon after I started, I would have named FFX HD my game of the year — the main thing holding it back is the cartoonishly rotten villain. Cut the villain out, and the story would have been stronger, more focused, more distinctively FFX, and less generic JRPG. Otherwise? FFX has the best combat system I can remember in a numbered Final Fantasy game; I especially liked the in-battle summons, which tied together setting (in FFX’s world, summoners have almost religious significance) and gameplay. The world itself wowed me. The protagonists felt believable: in their own right, in how they interacted with each other, and in how they fit into society. And this paid off when characters grew, or revealed hidden depths. Overall, Final Fantasy X HD is my runner-up for game of the year. Finally, I should give a shout-out to my favourite pre-2014 game: XCOM: Enemy Within. As a strategy game, XCOM plunges me into thorny ambushes, and then makes me feel a genius for deducing the way out. As a story generator, XCOM can be either a tense emotional rollercoaster (if I turn the difficulty up), or a fun, stompy blockbuster (if I turn the difficulty down). Either way, it’s still one of the best games I’ve played. Age of Wonders III (2014 release) — Enjoyable fantasy tactical battles, marred at launch by a weak late game. Now that the expansion is out, I’d like to revisit this some time. The Banner Saga (2014 release) — A debut tactical RPG characterised by attractive art and a unique battle system. Its story contains some powerful moments, but suffers from odd pacing and a poorly integrated side story. Still, a good game that’s worth a look for genre fans. Child of Light (2014 release) — Ubisoft Montreal’s “greatest hits” tribute to the JRPG genre, Child of Light is a gorgeous, often atmospheric game with a very good battle system. Where CoL goes wrong is writing. Everyone speaks in rhyme, which works better in theory than it does in practice — the handful of prose is by far the clearest writing in the game. And as noted above, its plot is a giant missed opportunity. Overall, it’s much, much better as a game than as a work of fiction; recommended to RPG fans. Crusader Kings II (older game, expanded during the year) — see above. Endless Legend (2014 release) — Great setting, tense and challenging early game, lacklustre late game. This is one case where a work is so imaginative, I’m willing to forgive a lot. Recommended to 4X and turn-based strategy fans. Europa Universalis IV (older game, expanded during the year) — Grand strategy meets one of my favourite eras in history. The game itself took some big leaps in 2014; if I had to be stranded on a desert island with a handful of titles, this would be one of them. Final Fantasy X HD (2014 port of an older game) — see above. The Last Story (pre-2014 release)— This is the Star Wars of action-RPGs: an inspired take on a generic premise. The result is a swashbuckling action-RPG, and one of the previous console generation’s underrated games. If you have a Wii, check it out! Ni no Kuni: Wrath of the White Witch (pre-2014 release) — A game with great strengths and great flaws, NNK is packed with a delightful array of recruitable creatures… and then undermines itself with a horrendously thought-out system of EXP gain. Still worth a look for its sheer charm. Persona 4: Golden (pre-2014 release) — The Playstation Vita’s flagship game (itself a port of the PS2 original), P4:G refines the series’ signature combination of dungeon crawling and social simulator. Like Final Fantasy X, it would have benefited from less cliche and greater brevity — the main plot and quite a few character subplots feel padded. Still, the better characters are delightful, the dungeon-crawling is a lot of fun, and the music is glorious. Whether on PS2 or Vita, this is one game RPG lovers should play. Sherlock Holmes: Crimes and Punishments (2014 release) — a novel take on the adventure game that brings Sherlock Holmes to life. As depicted in-game, he’s brilliant, assured verging on arrogant, and well-voiced. And by making players think through the available evidence before choosing one of several solutions, C&P manages to put us in the detective’s shoes. Overall a strong package, with some room to improve (there’s too much pixel-hunting, and not enough of the well-written and funny banter between Holmes and Watson). I look forward to the next Holmes game. Tales from the Borderlands (2014 release) — The adventure gaming equivalent of a tasty hamburger and chips, Tales’ first episode was colourful and laugh-out-loud funny. Recommended to those after a lighter game. Tearaway (pre-2014 release): Back in January, I described this as “one part game, one part tech demo for the PS Vita, and one part toy”. Quirky and playful, Tearaway is a platformer that invites you to personalise it by using the Vita’s camera to photograph the real world. And then, in the real world, you can print out and assemble papercraft versions of the objects you’ve encountered in-game. Vita owners should give it a look. Those with young kids should run out and buy it today! This War of Mine (2014 release) — TWOM is built around two interesting concepts. The first, showcasing the experience of civilians during wartime, is long overdue. The second is a Hobbesian view of human nature, in which social breakdown could turn any of us into a beast: this reviewer’s experience is emblematic. On the other hand, if things do not go horribly wrong, and the player is not reduced to desperate banditry, then the game sinks into a repetitive routine. (Quite possibly, this is an accurate depiction of the subject — I’m reminded of the classic description of a fighter pilot’s life as 99% tedium, 1% terror.) Still worth checking out for the concept, although I have little urge to play more. Thomas Was Alone (pre-2014 release) — Proof that with good writing, almost anything can be charming. This is a puzzle game about moving around geometric shapes… named shapes, into whom the narrator breathes personality. Short and sweet. Valiant Hearts (2014 release) — Like TWOM, Valiant Hearts is built around an unglamorous depiction of war. At times, and especially in its second half, it succeeds brilliantly: it evokes terror, helplessness, and the occasional thrill. At other times, it falls flat: making the player fiddle with traditional adventure-game puzzles is a terrible way to evoke the battlefield, and the cartoonish steampunk villain is equally out of place. Overall, the concept and the high points mean Valiant Hearts is still worth a look. Valkyria Chronicles (2014 port) — Five years after its original release, VC is still one of the most remarkable squad-based games I’ve played — and this time, I know to skip the cutscenes. Recommended for all tactical RPG fans. Wargame: Red Dragon (2014 release) — Another case of “more of an old favourite”, this takes the basic design of Wargame: AirLand Battle, then shoehorns in more units, more countries, and some UI and rule tweaks. At times, the expanded unit roster edges into bloat, and the campaign slips by adding major scripted events that the player could not know about in advance. Still, the basic design remains excellent and the high points (amphibious assaults!) are very high — Red Dragon has given me almost 80 hours of enjoyment, in skirmish, campaign, multiplayer, and simple theory-crafting. This would be up there with Europa Universalis and Crusader Kings amongst my desert island games. Warlock 2: The Exiled (2014 release) — Warlock 2 takes a genre that’s usually about conflict between players (whether human or AI) and recasts it into an asymmetric conflict between player and environment. The computer opponents are pretty much window dressing; instead, the appeal (and the challenge) come from fighting your way across a hostile multiverse, taming the wilderness and defeating wandering monsters as you go. The result is another unique spin on 4X strategy, well worth checking out. XCOM: Enemy Within (pre-2014 release) — See above. Xenonauts (2014 release) — A clever remake of the Gollop Brothers’ 1994 X-COM, Xenonauts improves many aspects of the original… except one. Ultimately let down by grindy ground combat, Xenonauts is still worth a look for Gollop aficionados who want to see what can be done with the basic formula. Series newcomers should probably stick to Firaxis’ XCOM. Nonetheless, a promising start for the developers; I’d like to see what they do next. I generally only buy one game a year, to binge on during the winter months. Last year it was CK2. I’m leaning hard to Endless Legend this year, and your remarks might have just sealed it. Thanks for the vote of confidence! I hope you like it.